Teachers and students can use TED: Understanding Islam to enhance existing curricula in undergraduate education courses. Educators and students will find activities and multimedia resources which link the study of Islam to the real world, plus expanded academic content such as key terms, related journal articles and major debates in this highly topical area. For an abridged, interactive version of this content, subscribe to the TED: Understanding Islam course via the iTunesU course app for iPad by clicking here. Prof Tamara Sonn of the College of William and Mary frames the TEDtalks in the context of the academic study of Islam, tracing its long history and the debates and misconceptions which are so much a part of current discourse. With a Foreword from Mumtaz Ahmad, President of the International Islamic University, Islamabad. Watch the 2010 TEDTalk "Lesley Hazleton: On reading the Koran." Journalist, psychologist and religious scholar Lesley Hazleton spent three months in a close reading of the Koran, studying four well-known translations and the seventh-century Arabic text. What she discovered as a self-identified 'tourist' was quite different from what she calls the "highlighter version" favored by Muslim fundamentalists and anti-Muslim Islamaphobes - particularly in its depiction of paradise, which Hazleton argues has nothing to do with 72 virgins. Watch the 2008 TEDTalk "Karen Armstrong makes her TED Prize wish: the Charter for Compassion". While working in Jerusalem on a film about early Christianity, religious scholar Karen Armstrong encountered Judaism and Islam and realized she knew very little about either. Studying the other Abrahamic religions enabled her to see her own faith in a new way, and underscored an important connection these three share with other major faiths: the role of compassion, which Islam identifies as "Ar-Rahman," one of the 99 attributes of Allah. Watch the 2009 TEDTalk, "Imam Feisal Abdul Rauf: Lose your ego, find your compassion". Imam Feisal Abdul Rauf illuminates the importance of compassion within the Koran and in Sufism, the mystical dimension of Islam. Abdul Rauf calls Jesus "the master of Sufism" and believes that spiritual people of all faiths share a common goal: "the language differs, but the objective is the same...whatever the name might be through which you name or access the presence of divinity." Watch the 2011 TEDTalk "Mustafa Akyol: Faith versus tradition in Islam". Turkish journalist Mustafa Akyol shares how a visit to Mecca got him interested in the ways that traditions in predominantly Muslim societies are often assumed to emanate from the Koran. Akyol explains how practices like stoning, honor killings, the seclusion of women and female circumcision predates Islam - and he probes the politics that caused modern Islamists to embrace them. 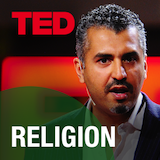 Watch the 2011 TEDTalk "Maajid Nawaz: A global culture to fight extremism". British-born Maajid Nawaz understands religious extremism, since he spent more than a decade in one Islamist group before serving time in an Egyptian prison. Now the organizer of a counter-extremism movement working to promote democracy in Pakistan, Nawaz identifies four reasons why it's been difficult to advocate for democracy in Muslim-majority societies. Stereotypes of Islam-Did you hear the one about the Iranian-American? Watch the 2010 TEDTalk "Maz Jobrani: Did you hear the one about the Iranian-American?" Iranian-born stand-up comedian Maz Jobrani has had more than one Hollywood casting director pitch him the part of religious fanatic. Jobrani tours internationally and challenges stereotypes of the Muslim faith and the Middle East. Watch the 2009 TEDTalk "Shereen El Feki: Pop culture in the Arab world". The Qur'an encourages Muslims to learn from other cultures and countries, so Shereen El Feki isn't surprised that some Arab cultures are adapting western style music videos, comics, and even Barbie to promote positive perspectives of Islam. Watch the 2010 TEDTalk "Naif Al-Mutawa: Superheroes inspired by Islam:. Clinical psychologist Naif Al-Mutawa worked with a team of artists and writers to create The 99, a collection of comic book superheroes based on the 99 attributes of Allah. The comics have been translated into eight languages so far and have spawned a theme park and an animated series. Al-Mutawa hopes his work will help young Muslims avoid identifying with extremists and introduce Islam to people outside the faith in a positive light.